There is beauty in simplicity. I appreciate those little tools that do one thing, do it well, and don’t try to be anything else. Did you know that hidden in your Apps folder on your Mac is a little app called Image Capture? What does it do? It takes pictures or videos from a device (camera, iPad, iPhone) and lets you import them to your Mac and save them wherever you want. When do I use it? 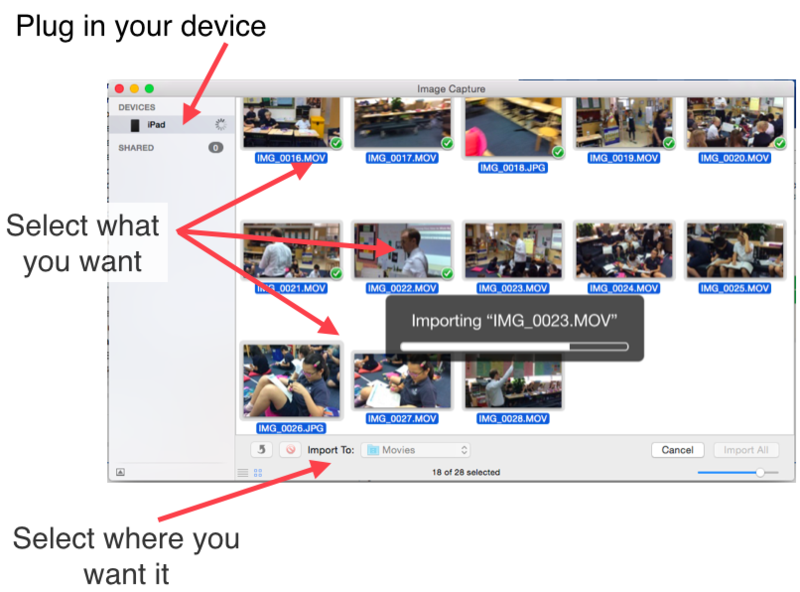 When I want to take a few images or video that I shot on my school iPad and copy them to my desktop or a folder on my Mac. I DO NOT want to add these images or videos to my photo library. I DO NOT want to sync the iPad or back it up. I DO NOT want to copy everything. I just want the pictures and videos I want, where I want them. Image capture does just that.